Back in the 60s and 70s, almost every performance sedan was turned into a rally car by someone. Many were just experiments to prove that an ill-suited car could be made into a rally car if you spent enough time, effort, and money. However, a select few cars became stellar cars in stock form, in rally form, and in many different forms of racing. They became legends and cult cars, and they are worshipped today by people in the know. 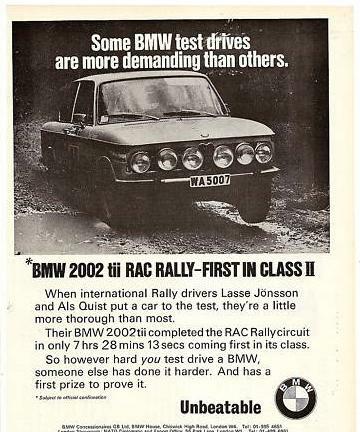 Such is the case with the BMW 2002. Does the fact that I have owned several over 20 years make me biased toward this fantastic sedan? Yes, but it is still one of the greatest sporting sedans ever built. The competition lineage could fill a book, and in its first year 1968, it shocked the motorsports world. According to Taylor and Macartney (The BMW 2002), in addtion to the European Touring Car and Hillclimb championships, the 2002 had 101 victories, 152 category wins, 1099 calss wins, and 996 gold medals. Not bad for a rookie year! Such success set the stage for competing in the dirt and gravel and snow of the rally world. There had been BMWs offroad prior to this going back to the prewar era, and including the predecessor 1600. The 2002 continued the proud tradition and competed at the highest level including the inaugural WRC season in 1973. In that year Achim Warmbold won the Rally Poland, and the Austrian Alpine Rally. In the Austrian Rally, 2002s were also 4th, 9th, 14th, and 16th. Here is some great video from that season. By the way, the co-driver for Warmbold in the 2002 that year was none other than current FIA president Jean Todt. Ultimately, the 2002 was not the best platform for a rally car at that time. It had stiff competition from the Lancia Stratos and the Fiat Abarth. It slowly faded out of the competitive rally scene as its production was drawing to a close. The car looks great in rally trim, and continues to be campaigned in vintage rallies today. It has also become a cult car for a whole new generation. In the words of David E. Davis, you can still turn your hymnals to 2002.